I have an international 255 that acts very strange at startup. It is a 3 cylinder (mitsubishi?). Starts ok when cold, but if I run it, and stop it and start it again soon, the starter has a hard time turning the engine over and it just puffs BLACK smoke. Also, when it does finally hit and turn on its own, it smokes black for a few seconds. Maybe start by checking the valve clearances and injector pump timing. If these are OK I'd test the injectors. A new air filter wouldn't hurt but that's not likely the problem if the black smoke clears up. You might note if it's running hot during operation. 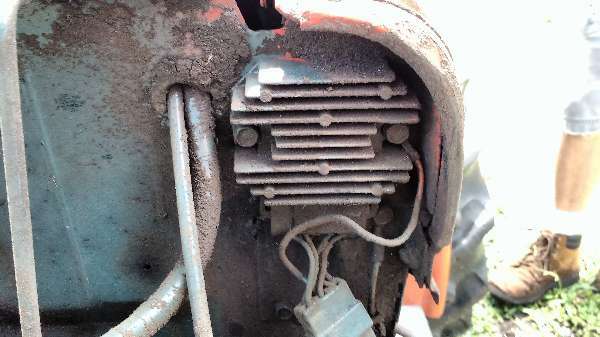 In addition to Tom's suggestions, I would recommend you check the battery, battery and frame ground as well as starter connections. Sounds like you may have a start system problem that is aggrivated by the heat of an operating temp. engine. A fault battery or ground/starter connection could cause this symptom. I would inspect and thoroughly clean ALL the connections (any relays included) and verify the battery is good with a load meter. Thank you. It does seem a bit hot. I don't have specs on the engine. Would it hurt to take out the thermostat and see if there are changes? I've sprayed through the radiator and its recently had a coolant change. I never heard of the battery getting hot and causing that problem but it makes sense. What explains the ultra-black smoke? A diesel needs heat and compression to fire the diesel fuel. When you crank a cold diesel, the fuel does not get burned completely if at all for the first few revolutions of the start attempt; thus the white smoke. A hot diesel engine going through an attempted start sequence is injecting fuel into a hot cylinder which becomes nearly as hot as a running engine during the compression cycle. The fuel is more completely if not completely burned; thus accounting for the black smoke. You get more black smoke on start up since the pump is injection fuel for start up. When proper rpm is reached the injection pump does not inject as much fuel. Try load testing your battery. Have you checked it for proper electrolyte fluid level? In addition to Chief's suggestions, you might notice if it smokes at all after it warms up--except when throttle is added. You also might run it for a few minutes at slow idle before shutting it down to see if that cures it. With all this cranking and smoking you'll want to change the oil frequently till it's figured out and notice if there's coolant in the oil. I'd check the fan belt tension and maybe suspect the water pump if it has many hours on it. This is more of an unlikely scenario but it is possible that a faulty or leaking fuel injector could aggrevate or cause this symptom. If the injector leaks fuel into the combustion chamber; the leaked fuel could ignite prematurely and cause the symptoms you describe. The engine would smoke a good bit ususally if this is the case. If you suspect this; you will have to pull the injectors and have them bench tested for spray pattern, correct popping pressure, and leakage. This does not sound like the case since you mentioned that the engine exhaust cleans right up after it gets running.